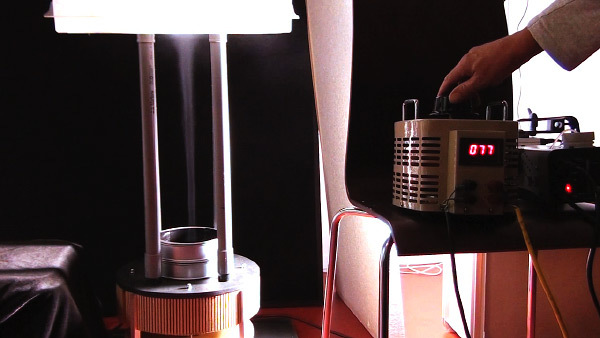 The curved vortex experiment movie (2010). Goal of the curved vortex design, is to "fly by tornado". 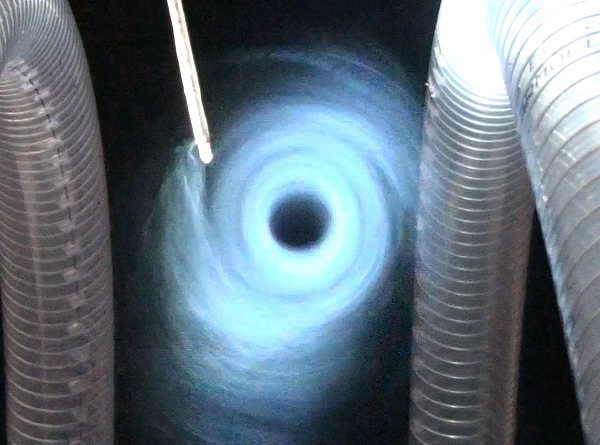 Fourth vortex experiment of 2010 (2010-11-14). I managed to get a great look in "the eye of the vortex". The latest vortex machine has been almost completely rebuilt, with the much help of Alex Baumgart, and many other friends. 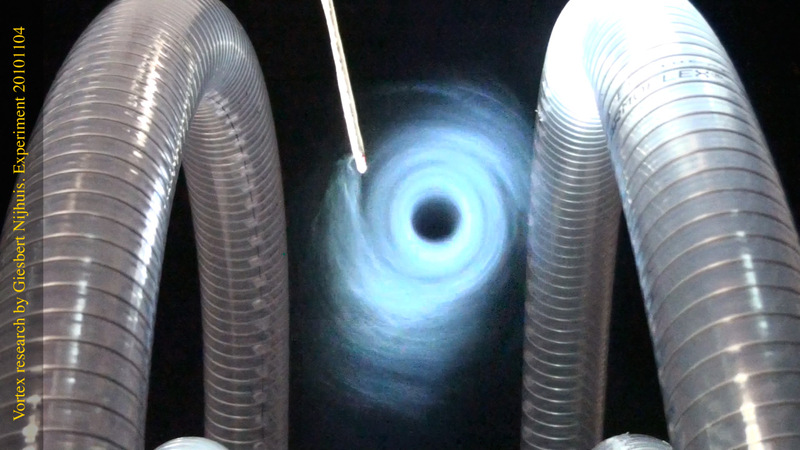 The improved vortex machine gives a great view on the eye of the vortex. 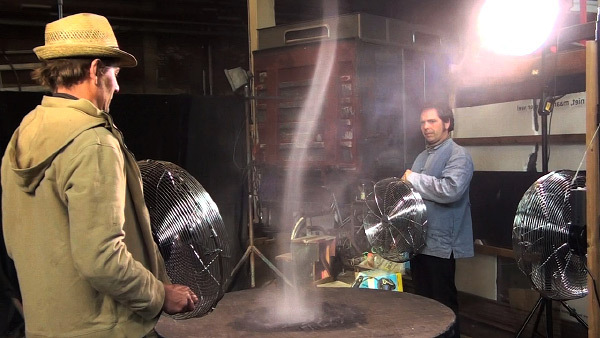 A tornado is the big natural phenomena, but inside the tube of a tornado is a vortex, just like this one, only this one has a diameter of only 1 cm. It also reminds me of the shape of a galaxy. Third vortex experiment of 2010 (2010-08-07). A vortex machine like this is made by many (4 poles with holes), but I wondered what would happen if we'd crank up the power! Second vortex experiments of 2010 (2010-06-01). 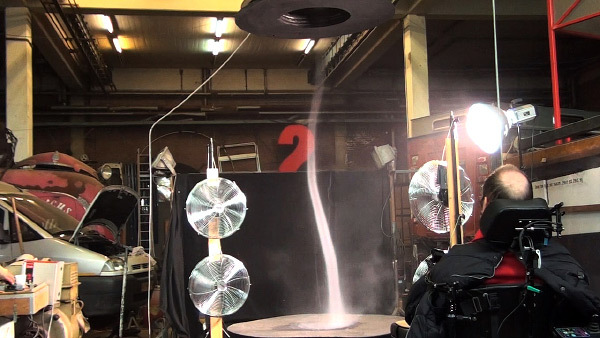 The little tornado got up to 2.8 meter high this time! The stability of the surrounding & drive air, is much better than last time, but it can still be improved a lot. A huge tornado can be dangerous, but a small one like this is very fragile. If the conditions aren't just right, it disappears in less than a second. One frame showed something special: a double layered vortex. Is this just two layers of visibility, or is the construction of a vortex more complex than I thought? First vortex experiments of 2010 (2010-04-18). 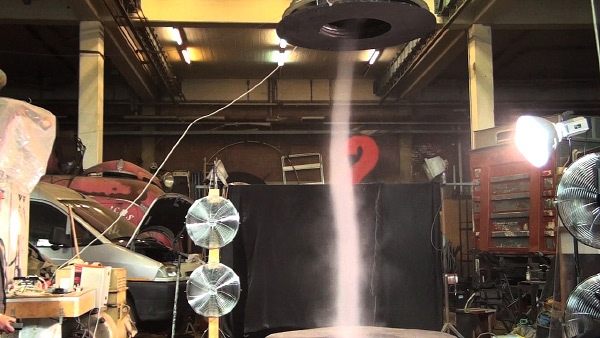 The little tornado got up to 1.5 meter high this time. 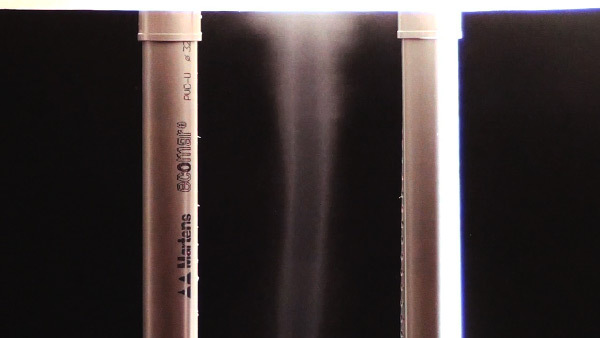 The improved smoke table made the vortex more clear to see. 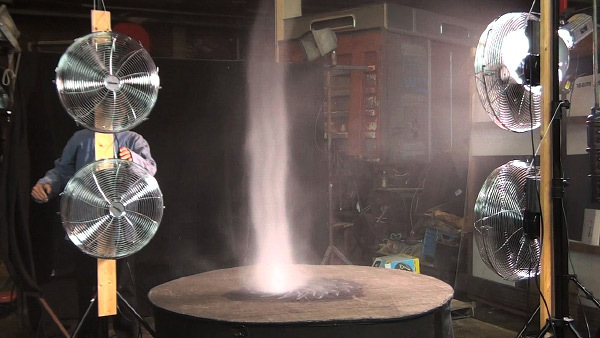 The previous experiments showed that everything heavier than air gets thrown out of a vortex, and this fire vortex shows that fire -being lighter than air, wants to go to the center of a vortex. The fans on the sides proved to be essential for a vortex this tall. The stability of our vortices, we're going to improve that next time. 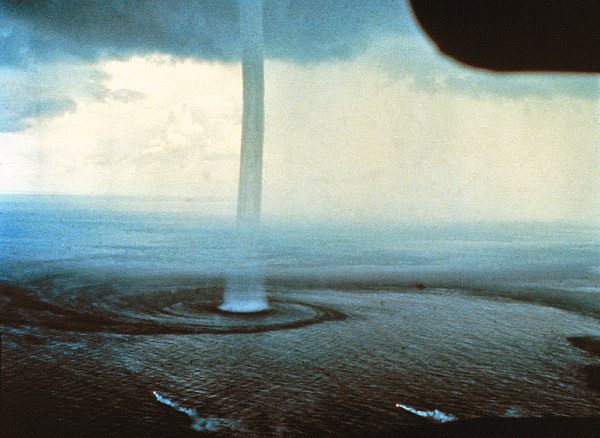 Great photo of a waterspout (photo source unknown). Look not at the waterspout itself, but at the water, that shows how the air at the water's surface is flowing. There is banding in the inflowing air. Nature is the great teacher.